This airticle is aboot the ceety in Brazil. For ither uises, see Joinville (disambiguation). 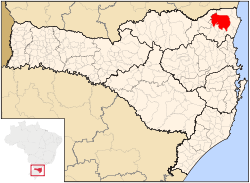 Joinville (Portuguese pronunciation: [ʒõjˈvili], [ʒo.ĩˈvili] or [ʒwĩˈvili]) is the lairgest ceety in the state o Santa Catarina, in the Soothren Region o Brazil. It is the third lairgest municipality in the soothren region o Brazil, efter the hintle lairger state caipitals o Curitiba an Porto Alegre. Joinville is a major industrial, financial an commerce center an aw. Wikimedia Commons haes media relatit tae Joinville.